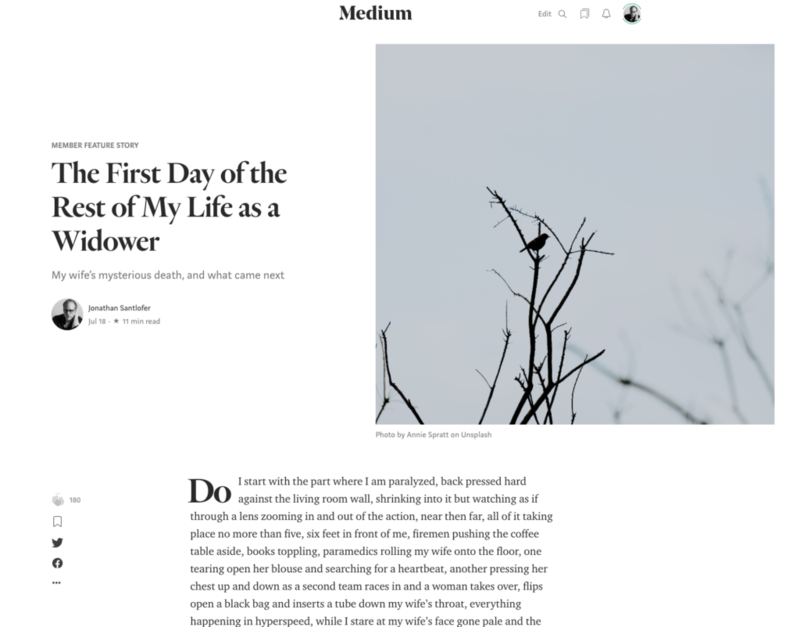 Medium.com has featured an excerpt of The Widower’s Notebook as a featured member story. The First Day of the Rest of My Life as a Widower. My wife’s mysterious death, and what came next. I start with the part where I am paralyzed, back pressed hard against the living room wall, shrinking into it but watching as if through a lens zooming in and out of the action, near then far, all of it taking place no more than five, six feet in front of me, firemen pushing the coffee table aside, books toppling, paramedics rolling my wife onto the floor, one tearing open her blouse and searching for a heartbeat, another pressing her chest up and down as a second team races in and a woman takes over, flips open a black bag and inserts a tube down my wife’s throat, everything happening in hyperspeed, while I stare at my wife’s face gone pale and the room going gray and grainy as an old photograph? This entry was posted in Articles and tagged Joy Santlofer, Medium, The Widower's Notebook. Bookmark the permalink.